If you like your dress shirts with style and flair and shun the ordinary, dress shirts by Steven Land are for you. 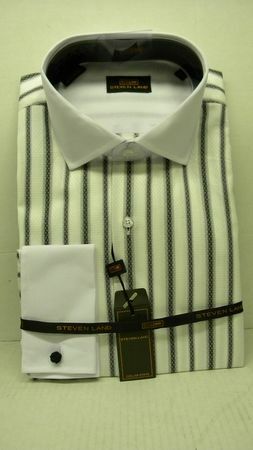 Steven Land shirts are the new style of dress shirts that all other dress shirt brands are judged by. Made of all cotton fabric with unique style french cuffs and spread collars, Steven Land shirts are always a cut above the rest. This black and white stripe Steven Land shirt featured bright white cuffs and collars and black and ivory pattern fabric with a unique weave. You'll love the way this Steven Land shirt looks with your favorite black or grey suit.